As you know by now…all of us girls in the house are battling the cold of the century. Runny noses, hacking coughs, puffy eyes, 100 degree fevers, lazy-daisy feelings…. Yes, my hubby is definitely done-for. It doesn’t really help that sick ol’ mom (aka me) is also the one who gets to stay home with the sick 3 year old and 9 month old by herself. What’s a girl to do…I’m mean really?! Beg for mercy no doubt! Ha! 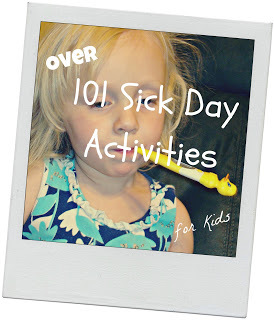 Well in case you ever find yourself in a similar predicament with a sick kid or a sick household, I’ve compiled a list of over 101 simple activities you may want to consider to pass the time until wellness once again fills your house. The good thing–most of these can be done IN bed or at least lying down. Oh, and as an added bonus, many of these activities also work well in the car too for those of you headed out on your summer vacations. So here it goes…. Read books to each other. Want a selection especially fitting? Check out one of these favorites. Go camping in the living room. Create a make-shift tent, get out the sleeping bags and snuggle down in this fun environment. Play doctor. Already Peanut has tried to give mommy medicine to make her feel better. Ha! If only her magic potion had worked! Play board games. Our current favorites? Hi-Ho Cherry-o and Candyland. Play paper football on the bed. Roll up a sheet or blanket for the goal and you’re set. Drink liquids through a crazy straw. Make and eat a fruit smoothie. Have a picnic lunch…on the living room floor. Even if its just cheese and crackers, just the thought will make it special. Create shadow puppets using a bedside lamp and your hands. Take a glow-in-the-dark bath using glow sticks. Get in some target practice with a water gun or spray bottle and some floating rubber ducks in the bathtub. Play with magnets on a cookie sheet. Alphabet magnets or magnets added to the backs of puzzle pieces can be great fun on a cookie sheet and they won’t get lost in the bed. Play sock ball. Try making a basket by tossing a balled up pair of socks into a laundry hamper. Make and eat homemade popsicles. My mom would always mix half orange juice and half 7-up, then place it in some ice cube trays with some toothpicks when I was sick. In a few hours we had some yummy homemade popsicles. For a healthy version you could always just freeze one or multiple kinds of fruit juice which is just as yummy on a sore throat. Make a collage. Cut pictures out of old magazines and paste onto computer paper. Play Pictionary on a Dry-Erase Board. Make things out of Wikki-Stix or use them to outline pictures in a favorite book or magazine. Complete a Yes & Know or other similar invisible ink book. I loved these growing up and always looked forward to getting another either with I was sick or traveling. Have fun with Sticker Activity Books. Solve some mazes in a Maze Craze Book. Draw on an Etch a Sketch. Listen to a book on CD or mp3. Listen to music on CD, mp3, or Pandora. Make popcorn and try making a hole-in-one by tossing a piece one-at-a-time into the other’s mouth. That said, I probably wouldn’t do this if the sick person has a sore throat. Popcorn sometimes itches going down. If not popcorn, grapes have also been known to work pretty well too. Learn to do card tricks. Eat a Tootsie Pop and count how many licks it takes to get to the center. Become a pro at making airplanes with the World Record Airplane Book. Have a tea party…in bed. Play with matchbox cars…in bed. Wrinkle the bed sheets up to create roads and hills and away they go. Write back messages. Have one person write a message on the second person’s back with his finger. The second person’s goal is to then try and guess the message the first person wrote. Switch and repeat. Play a game on the iPad. Snuggle on the couch as you watch a favorite TV show or movie. Sort buttons, counting bears, beans, pom-poms, or Lego pieces in the cups of a muffin tin. Lace wooden beads or lacing cards. Take pictures of the room with a digital camera. What better place for them to practice picture taking than on the bed? If it is accidently dropped, there’s a cushioned bed for it to safely land on. What kind of weird contemporary views can you get when you use the zoom? Make up stories. You could even expound on this by having one person start the story and each person adds to the story one sentence at a time. Who knows, with a trade-off like that, you may have a new novel in the making. Write letters…to family members, friends, or neighbors. Play the spelling game. We often played this game in the car when I was a child but it could work just as well on a bed. The first person chooses a word to spell, says the word and then spells the word. The next person then has to choose a word to spell beginning with the last letter of the first person’s word. And so the game continues. The only rules: The word spelled cannot be a proper noun and cannot be spelled more than once in a game. Create a marshmallow and toothpick sculpture on a cookie sheet. Play a card game like Uno, Phase 10, or Go Fish. Solve a mystery with One Minute Mysteries. Make a domino chain on the floor. And then, of course, tip the first one over to watch them fall! Play marbles on the floor. Do school work…but seriously, who wants to do that?! Do a Brain Quest deck. Be a beautician for a day. Take turns fixing each other’s hair. Yes mom, let her put 102 little hair clips in your hair. No one is going to see either of you all day anyway, well except maybe your hubby, but I’m sure he’ll understand. 😉 Grab some chap stick and a few cotton balls and you’ve got the makings of a make-up designer too. Organize a dresser drawer. I know, it’s not very exciting, but you can do it while sitting on a bed. Put together a puzzle on a card table or sheet of cardboard. Slide the flattened table or cardboard sheet under the bed to keep it out of the way when you are not working on it. Create coasters or Christmas ornaments with Perler beads. Complete a Word Search, Kakuro, Sudoku, or Crossword Puzzle. See how far you can get in a Brain Games or Mind Benders Book. Create your own patterns with pattern blocks. Have a timed race to see who can say the alphabet backwards the fastest. Play an alphabet sequencing game. Begin with a phrase such as “I’m going to my grandma’s house and I’m taking with me a…” or “I’m going to the grocery store to get an…” or “I’m going to the zoo to see the….” The first person will then think of an object, food, or animal that begins with the letter A. The next person then repeats the “a” word mentioned and then add an appropriate “b” word and so the memory game continues until all the letters of the alphabet have been used. Get silly with magnetic games such as Wooly Willy, Hair-Do-Harriet, or Doodle Balls. Mold a fabulous sculpture using only aluminum foil. Solve a Perplexus Maze Ball. Search a Peek-a-boo bag or create your own treasure bottle. Laminate a self-portrait and draw silly faces on it with dry erase markers. Enjoy some good ol’ pencil and paper games such as tic-tac-toe, connect-the-dots, or hangman. Play math volley. One person thinks of a math problem (i.e. 1+7 is…) and the second person has to solve it. Once the second person solves the problem they then get to think of another problem for the first player. Take the time to memorize those Bible verses, math facts, states and capitals or other age appropriate rote information the child is needing to learn. Create a Christmas wish list. Play dress up with paper or magnetic dolls. Build words. The first player begins by saying a letter. The next player says the first player’s letter and adds the next letter of a probable word. The game volleys back and forth until either a word is created or a player cannot thing of a letter to create a word. The person to complete a word gets one point and starts a new word. Write messages with magnetic words on a cookie sheet. Read the cards from the Trivial Pursuit box or play the game. Create letters or shapes on a Geo-board. Look through old photo albums. Yes, the kids will enjoy looking at photographs of both themselves and you just as much as you do, especially if you tell them stories that go along with the photos. See how many objects you can find in an I Spy Book. Read a favorite kids magazine such as Highlights or National Geographic for Kids. Come up with a creative story using Rory’s Story Cubes. Give lots of hugs and kisses on the forehead. There’s just something about a mother’s love that seems to make it all better. How do you spend the day with your sick ones? Note: This post was originally published on June 6, 2012 and has been updated to include this list in a printable format! Thanks for reading and sharing and have fun playing! This post is shared in conjunction with iHomeschool Network’s “100 Things.” The iHN is a collaboration of outstanding homeschool bloggers who connect with each other and with family-friendly companies in mutual beneficial projects. Visit us on Facebook, Pinterest, and Twitter. And of course, I encourage you to visit all the 100 things lists from other homeschool moms of the iHomeschool Network. This is such a great collection! I’d love to invite you to share it and any other posts with us at Saturday Show & Tell on Cheerios and Lattes! I know my readers will love these too! Great ideas! So cute! I’d love to invite you to join us and share Saturday Show & Tell on Cheerios and Lattes! I know my readers will love your ideas too! Do we have to be sick? This is just a great list. Just pinned it. Thanks! What a great list of ideas! This is perfect for when you just need something to do. Thanks so much for sharing at Mom On Timeout! Thanks for the ideas and inspiration–very helpful for us while the sniffles run their course! Thanks so much for these ideas! My friend got a fever during a sleepover we had and stayed in bed the entire time. Wish we had these then. I just wanted to let you and others know that Dads give good kisses on the forehead too 🙂 … anyway, don’t forget about the fathers out there too, ok? I admire what you’re doing BTW. LOL. That is so true. My apologies. Just my readers are primarily women. 😉 Thanks for sharing though. You are definitely right. Dads give good kisses on the forehead too. No need to apologize, truly. Thanks for the acknowledgement. I was home with my sick 3yr old this morning and came to your awesome, wonderful list of things to do. I’m sorry if I came across terse. I really am amazed that you do homeschooling while also being a parent. I’m in Canada and I don’t know if I could even handle 5% of your responsibilities. Bravo and well done. You have my complete respect. Oh no stress. I was not cross. It actually made me smile. And I’m glad it was helpful! And thanks for the encouragement too. Hope your 3 year old is feeling better today. What a great list! Personally, the nap one is my favorite also 😉 Thanks for sharing at Merry Monday! Lol. Of course! Hey, thanks for hosting. Always a joy to connect with the Merry Monday group. I love this list! I’m the one who is sick, cancer. So I plan on implementing lots of these ideas into our homeschool day! Well good deal. I am so sorry you are battling cancer, but also thankful that these ideas may help you to still spend some quality time with your kiddos. God bless!